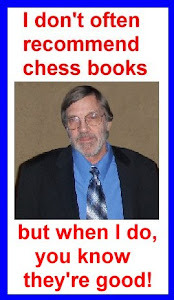 Just for the record Simon Webb (10 June 1949 - 14 March 2005) was a British IM and Correspondence GM as well as an author. Webb also represented England at bridge with his brother, Roger, as a partner. Chess for Tigers is an excellent book and one that will be referred to time and again. The book contains real life ideas that can be applied in your games. The first edition was published in 1978 and the third edition was updated just before Webb’s death. This book is full of practical advice on how to play better players, improve your opening repertoire, handle drawn positions and so forth; in short, practical stuff... suggestions you can use regardless of your rating. His suggestions on how to play against higher rated players is invaluable. This is NOT a book for children who are just learning chess even though each chapter begins with a cartoon of a chessplaying tiger and has some silly chapter titles like How to Catch Rabbits and How to Trap Heffalumps. Webb defines a ‘tiger’ as a winner and his suggestions are more psychological than a guide to improvement. For example, in the introductory chapter Webb asks the question 'are aiming to play the best moves or are you playing to win?' He opines that if you want to be a Tiger, you must forget about playing the best moves and try instead to win. Webb begins with the claim that, “You could be a much better chess player than you are.” and I doubt that any of us would disagree with him. I think it was US Senior Master Dr. Eliot Hearst who once described a ‘Master’ as ‘every player’s secret appraisal of his own ability’!! Webb discusses aspects of practical play that are often ignored such as the art of the swindle, or creating chaos against a stronger opponent in hopes he will blunder. In the first chapter, Play the man – not the board , Webb argues only an engine plays the same way against every opponent and to be practical . So, to be practical you should try to capitalize on any weaknesses your opponent might have. He admits that you can’t spend a lot of time preparing for your typical weekend Swiss opponent "but you should still be able to make good use of anything you know about your opponent's style of play." Webb claims that even somebody you never met before gives clues by his appearance, his mannerisms, his age, etc. that might give you a hint as to what kind of player he is. Most people tell you to play the board and not the man because if you alter your style based on your opponent you are more likely to get into positions you aren’t familiar with and you can get into trouble not only psychologically, but you run the risk of getting bad or unfamiliar positions. I’m not sure I agree with Webb's advice on this though. Webb gives valuable advice on how to use the information gleaned from you analysis that will enable you to play to your strengths rather than to improve upon one's weaknesses. Once again, this advice is an attempt to maximizing your practical results. When it comes to everybody’s favorite topic, openings, Webb recommends having a primary and a secondary opening in your repertoire and he includes some brief comments on how to go about learning an opening given a limited amount of time to study. In the chapters How to catch Rabbits and How to trap Heffalumps, Webb recommends adopting a style to counter your opponent’s. Again, some may find the advice to change their style questionable, but I do agree with his advice on how to play against weaker opponents…keep things simple and wait for them to blunder. Come to think of it that’s how I play against stronger opponents in the hope that it's me that doesn’t blunder. That goes against Webb’s (and other player’s advice) to go for for positions that are so complicated and unclear that either player is likely to make a mistake. Remember that in this book Webb is only concerned with winning and not becoming a better player through increasing one’s understanding of chess. His point is that it’s only a game, and we are within our rights to do anything we can within the rules to win. Other chapters include How to win won positions, What to do in drawn positions, Clock control, and How to avoid silly mistakes. One point Webb makes in the latter chapter no longer applies though because of a change in FIDE rules. Webb advised writing your move down on the scoresheet before playing it. This was almost always the way we did it back in the old days and it wasn’t uncommon to see scoresheets with half the moves scratched out as minds were frequently changed. Players often took three approaches. 1) write the move down and immediately play it 2) write the move down while shielding it from your opponent’s view with the other hand then lay your pen over the move and think a few more seconds before making it. Then there was the third type; the type who would do something I’m sure would have met Webb’s approval; write their move down in full view of their opponent then stare at the board for a couple of minutes knowing that your opponent was thinking about how to meet the move written on the scoresheet then play something else. In the final two chapters Webb covers Quick Play and recommends a gambit opening repertoire because the clock is a factor and in Correspondence Play he advises being particularly careful in your choice of opening since a poor opening can lead to literally years of suffering. For all players under master! This was a fun book to read. It really only covers psychological aspects of chess, not a how to improve you chess.